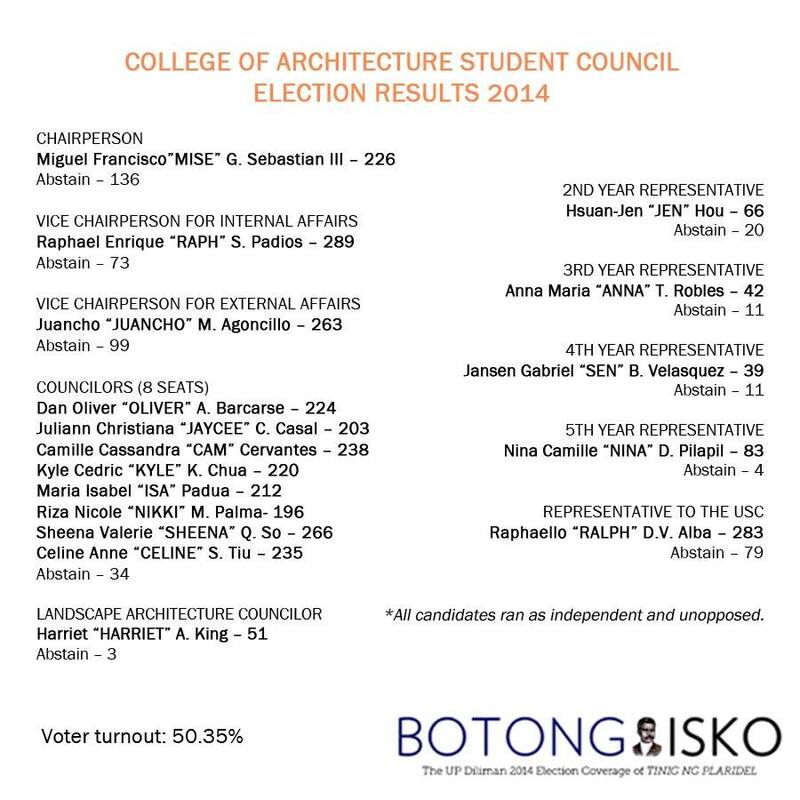 All posts in the next UP College of Architecture Student Council will be occupied by unopposed independent candidates after the conclusion of Thursday’s polls. Two incumbent council officers ran for reelection. Incumbent Arki councilor Miguel Francisco Sebastian III is now the local council’s chairperson-elect while incumbent second year representative Raphael Enrique Padios was elected vice chairperson for internal affairs. Newly-elected Arki chairperson Miguel Francisco Sebastian III plans to continue the projects and programs of the previous council and engage their constituents in activities and campaigns outside of the college. “It has come to our attention that the constituents want us to be more aware and out there,” said Sebastian. The college recorded a voter turnout of 50.35 percent, slightly higher than last year’s 50 percent. Sebastian also said that although the college reached a high voter turnout this year, the scheduling of the local elections should have considered the college’s class schedules to draw in more voters. “I was just hoping that the scheduling of the elections could have been towards the favor of the college because unfortunately, for us, there are only a few classes scheduled this day. So we experienced complications in getting people to vote,” added Sebastian. Unlike last year, the bid for College Representative to the University Student Council was easily snagged by independent candidate Raphaello Alba, who ran unopposed. The previous College Representative to the University Student Council was Nagkakaisang Iskolar para sa Pamantasan at Sambayanan (KAISA)’s Jose Ruel Fabia, who won against Student Alliance for the Advancement of Democratic Rights in UP (STAND UP)’s bet Rebomafil Bayot II.